Enter Kandy- the kingdom in the hills. 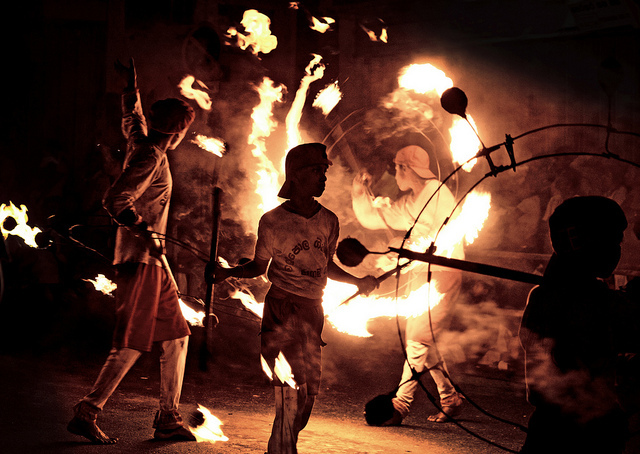 Since ages long past, the city has been considered one of Sri Lanka’s most important and historical locations. It was the last capital of the ancient kings’ era and is home to the sacred Temple of the Tooth Relic (Sri Dalada Maligawa), one of the most sacred places for worship in the Buddhist world. 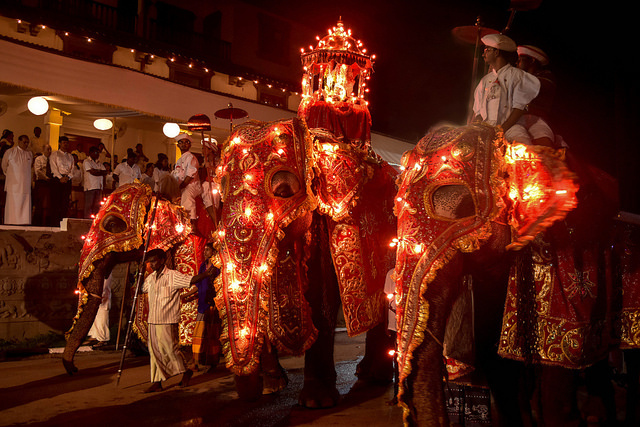 The Kandy Esala Perahera (the Esala Parade of Kandy) also known as “The Festival of the Tooth” is a grand festival celebrated with elegant costumes, elegantly dressed, domestic elephants, traditional eastern dancers performing sword dances, fire dances, whip dances and so much more. It is held annually between the months of July and August and pays homage to the Sacred Tooth Relic of Lord Buddha, which is housed at the sacred temple. The perahera (procession/parade) begins with the Kap Situveema or Kappa, in which a sanctified young Jackfruit tree is cut and planted within the premises of four Devales (shrines) dedicated to the four guardian deities Natha, Vishnu, Katharagama and the goddess Pattini. The festival comes to a close with the traditional diya-kepeema ritual; a water cutting ceremony which is held at the Mahaweli River (Sri Lanka’s longest river) at Getambe, Kandy. Historically believed to be a fusion of two separate processions - The Esala and Dalada, the two peraheras are documented to have dated as far back as the 3rd and 4th centuries BC. The Esala (3rd Century BC), was a ritual sanctioned to request the gods for rainfall and the Dalada is believed to have begun when the Sacred Tooth Relic of the Buddha was brought to Sri Lanka from India during the 4th Century CE, eight hundred years after the passing of Lord Buddha. 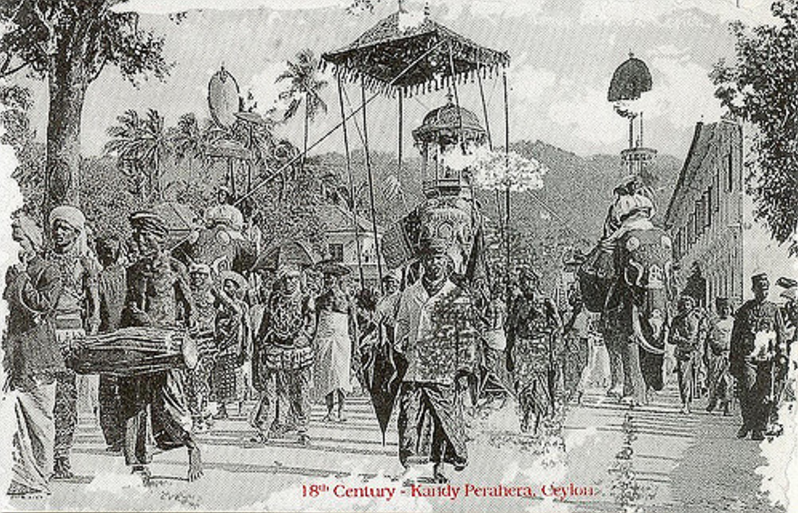 According to the historical literature and ancient texts, the sacred relic was taken in procession to Sri Lanka by Princess Hemamala and Prince Dantha. The Modern Perahera dates back to the rule of Kandyan King, Kirthi Sri Rajasinghe (1747–1781). During his reign, the Tooth Relic was not disclosed to the public. However, King Rajasinghe decreed that the Relic be taken in procession for the masses to see and venerate. After the Kingdom fell to the British in 1815, the custody of the Relic was handed over to the Maha Sanga (the Buddhist Clergy). In the absence of the king, a chief lay custodian known as the "Diyawadana Nilame" was appointed to handle routine administrative matters. However, the Esala Perahera actually comprises of five separate Peraheras - four from the Kandy shrines to the deities – with order of precedence maintained throughout. 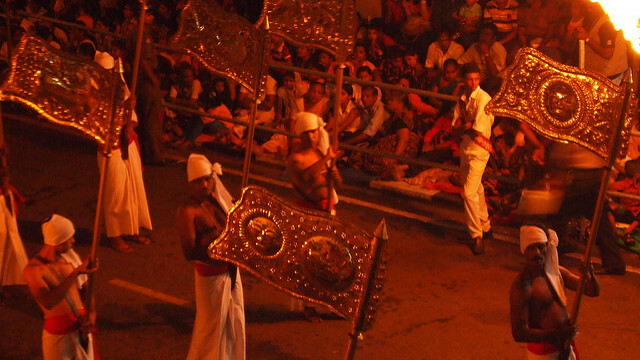 Led by the Dalada Maligawa Perahera, the second is to Natha, a deity of special importance to Kandy who is believed to be Buddha-in-waiting. The third is to Sri Lanka’s Guardian Vishnu- one of the three great Hindu gods and an important figure in representing the crossover between Hindu and Buddhist beliefs. The fourth and fifth processions are from the shrines of the god of war and victory Katharagama, and goddess of chastity Pattini. This grand event attracts thousands of religious devotees from all around the world and also tourists, who wish to learn of Sri Lanka’s rich culture and elaborate history. It has been one of Lakpura’s greatest pleasures to be able to give our clients this rare experience and received a lot of positive feedback from those who witnessed this awe-inspiring event. With every year, we aim to continue providing first-hand experiences of this sacred festival. The 2017 Esala Perahera was a complete success and surely will continue successfully in the many years to come.